Fantastic for snacking or as holiday gifts! 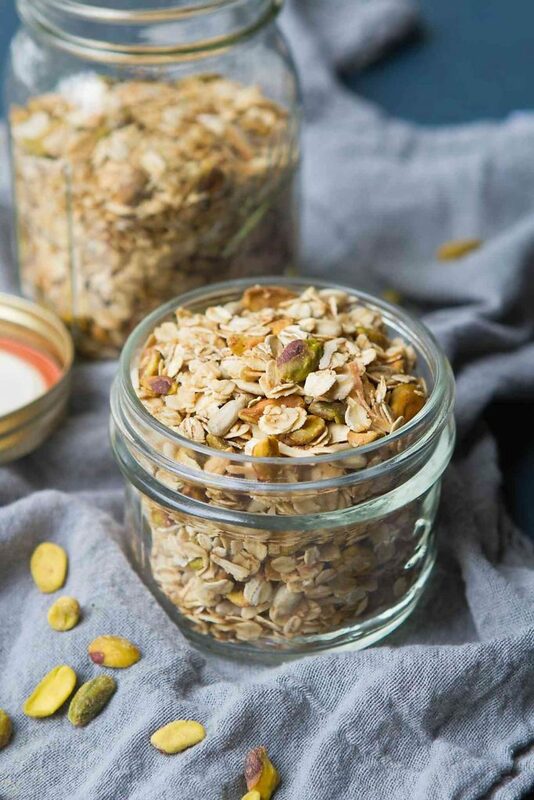 Whip up a batch of this healthy Maple Pistachio Granola in about 30 minutes, and use it to top yogurt or even ice cream. One of my all-time favorite breakfast recipes is this healthy yogurt parfait, which became a favorite while I was losing weight. It’s the perfect combo of protein and carbs to refuel after a workout, and takes all of five minutes to put together. For a long time, I used store-bought granola or some other cereal. 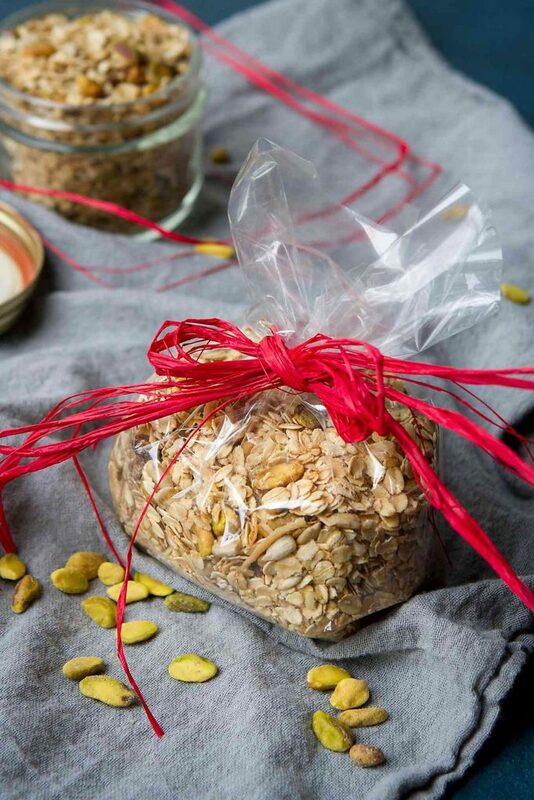 That is, until I realized how easy it is to make healthy homemade granola, which is typically much lower in fat and sugar than anything you can find on the grocery store shelves. 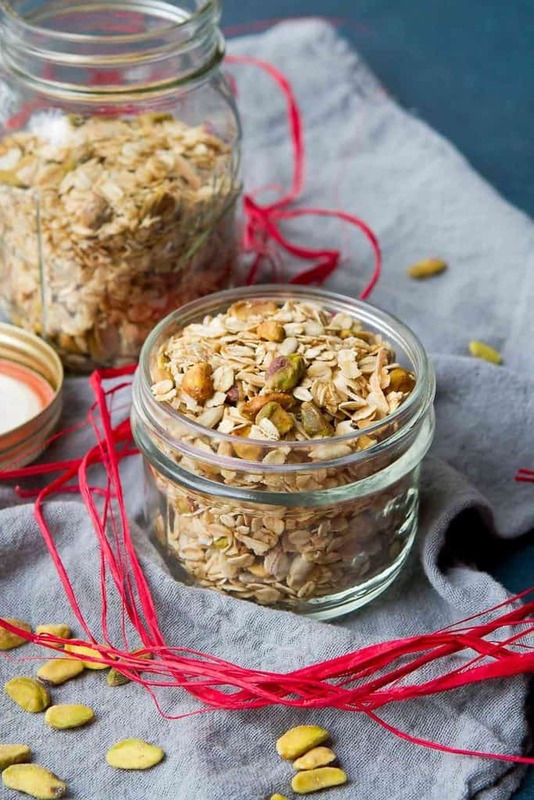 The beauty of homemade granola is that it’s completely customizable. Start with a base of oats – I typically use standard old fashioned oats, but be sure to look for ones that are marked as gluten free if you follow a GF diet. From there add your favorite raw nuts, seeds and/or dried fruit. 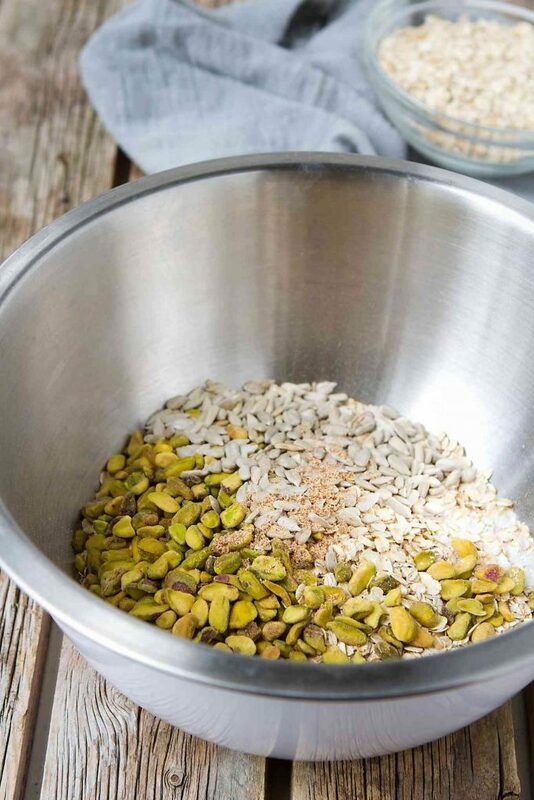 The sky’s the limit – anything from almonds to pistachios, pepitas to sunflower seeds and dried cherries to apple will work. I was feeling inspired by the holiday season, and pistachios are always around our house at Christmas time. Plus, they’re awesome with some grated nutmeg and unsweetened coconut flakes. While most store-bought granolas include brown sugar to sweeten things up, I opted for pure maple syrup. Agave nectar, coconut palm sugar or other sweetener alternatives are also options. Mix the maple syrup with some melted coconut oil, then stir in vanilla, grated nutmeg and a little salt before tossing with the oats and nuts. Spread the granola on a lined baking sheet, then bake until light golden brown. Be sure to cool completely before storing in some sort of airtight container, such as a glass jar. 1. Preheat the oven to 325 degrees F. Line a baking sheet with parchment paper. 2. 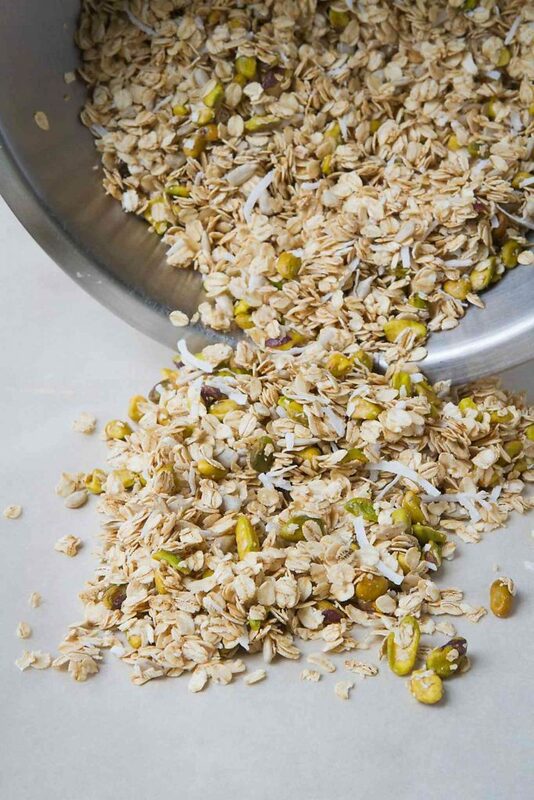 In a large bowl, stir together the oats, pistachios, coconut flakes and sunflower seeds. 3. In a small bowl, stir together the maple syrup, melted coconut oil, vanilla extract and salt. 4. Pour the maple syrup mixture over the oat mixture and mix well until the oats and nuts are coated. Transfer the granola to the prepared baking sheet. 5. Bake until the granola is light golden brown, stirring once or twice, 20 to 25 minutes. 6. Let the granola cool completely. Store in an airtight container, such as a glass jar, for up to 2 weeks.